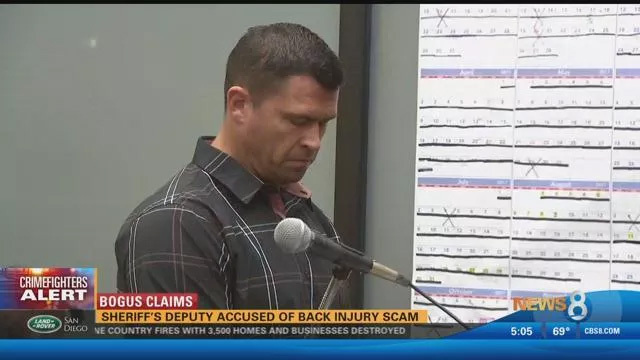 A former San Diego County sheriff‘s deputy who was seen lifting heavy weights after filing workers’ compensation claims for a back injury, which he said left him unable to do even light duty for most of last year, was sentenced Tuesday to three years probation and 180 days in custody. Matthew Tobolsky, 40, pleaded guilty last month to a felony charge of making a misrepresentation to get an unearned benefit. Deputy District Attorney Alan Kessler said Tobolsky — a five-year veteran of the Sheriff’s Department — filed the bogus claims after he pleaded guilty to a misdemeanor vandalism charge last year stemming from a domestic violence incident with his spouse. Kessler unsuccessfully argued that Tobolsky be sentenced to 270 days behind bars. “He let the people (of San Diego) down. He tarnished the reputation of a very fine department,” the prosecutor told the judge. Shamoon agreed to let Tobolsky do his custody time in a work furlough program. The judge said it was “almost an insult” that Tobolsky saw the alternative custody as an inconvenience. A hearing was scheduled for May 30 to discuss requested restitution of $84,494. Deputy Public Defender Edward Neusteter told the judge that Tobolsky had an MRI showing spinal complications and stayed out too long on workers’ compensation because he had concerns about going back to work. Before he was sentenced, Tobolsky apologized to everyone involved. Tobolsky said he had 50/50 custody of his two elementary school children but had them more than that. The defendant said he plans to re-enter society as a productive citizen.